It's that time of the year again, The Summer Holidays, also known as bankrupt time as more often than not our delightful little cretins are in need of new uniform, P.E kits and school shoes. The very thought of this mammoth shopping task makes my purse positively weep in utter despair. 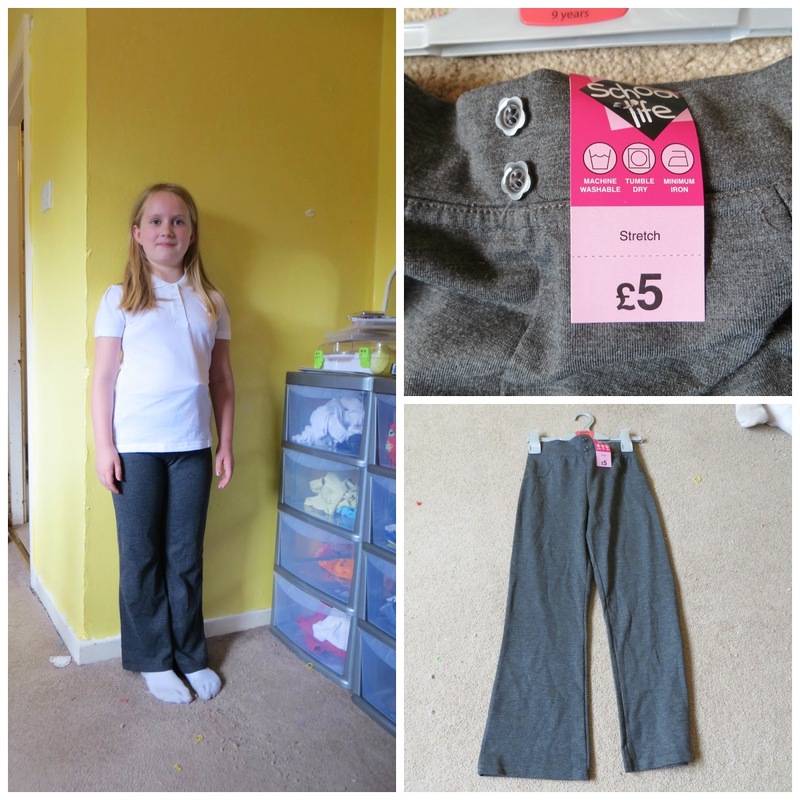 The lovely people at Matalan chose us to review their back to school range for The Spawn providing us, for the purpose of a review, a voucher for a selection of their school wear range. The Spawn spend longer in their school uniform then they do in their own civilian clothes so it's an absolute must that the items we buy are of a decent quality. Whether you have one child or several, we all want value for money. I for one resent being dictated to what my children should wear, so if they must wear a uniform I refuse to spend more than absolutely necessary on it. Be it painting or skidding in the playground, kids will be kids. Their uniforms need to be able to withstand this. Their uniforms take a lot of abuse and a lot of washing thus it's important they don't stain, rip or shrink too easily. As previously mention, our children spend a large proportion of their week in their school uniform thus it's vital that the uniform is comfortable and adjustable. First up, we received some lovely items for Thing Two. Thing Two will be starting year 3 in September. Look at the cute flower shaped button detail! Thing Two loves trousers. They're comfortable, warm and practical especially with Autumn and Winter just round the corner. Whenever possible I look for jersey stretch fabrics for her uniform as she finds them comfortable and they wash and wear well. 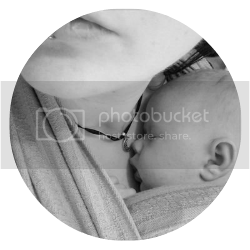 They enable her to learn and play without feeling restricted. This pair are an incredibly purse friendly £5, they're soft, stretchy and a decent length. As with all the Matalan back to school range they're machine washable and if you're lucky enough to have one you can bung them in the tumble drier too so perfect for parents as well as children. The pockets have cute button details too! Whilst she's still young, I'll admit I'm a sucker for a pinafore. As I'm an ironless slattern it's important to find a retailer that offer styles without pleats. 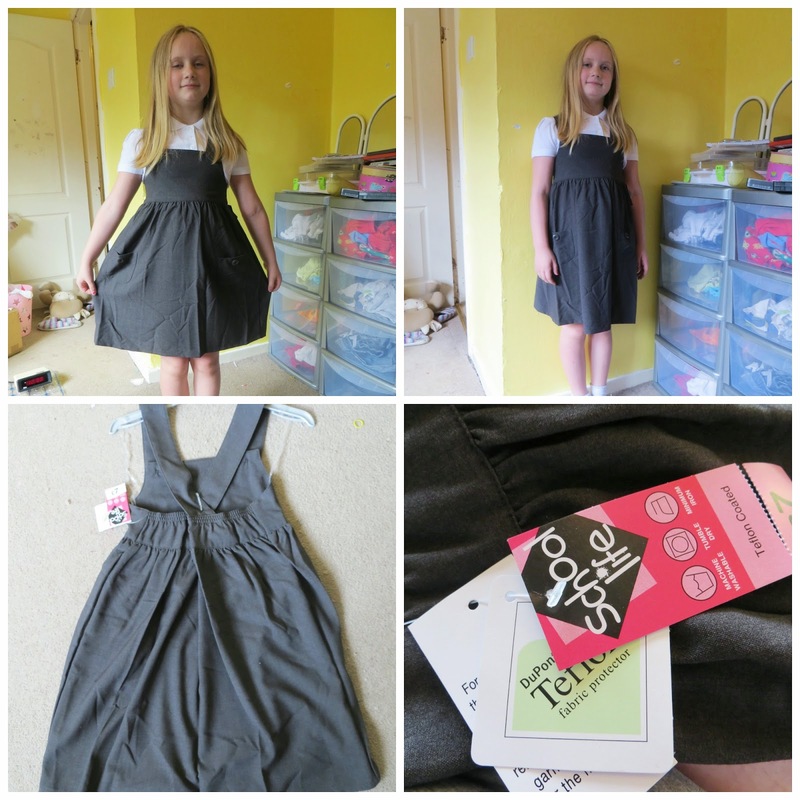 This particular pinafore fits the bill perfectly. It's a decent length on her, has a slight girly 'flare' for twirling and gentle elastic at the back for a perfect fit. It even has the added quirk of pockets, who doesn't love a dress with pockets?! An added bonus is the Teflon fabric protection which should help it last until she dares to grow again. 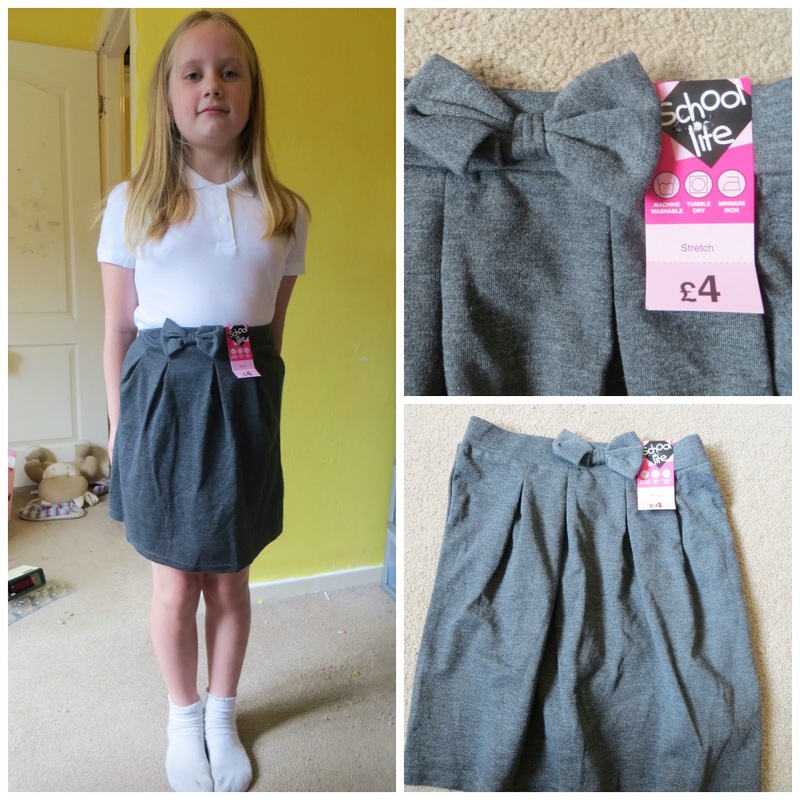 Priced at £6-8 it's competitively prices and makes a quality yet affordable addition to her uniform. The bow is adorable, we love it. Variety is the spice of life or so they say, so to complete her uniform we added a skirt to the mix. In the past we've found many of the skirts for her age range to be ridiculously short, not a problem with this one. Once again I opted for jersey both for comfort and the lack of fierce pleats that need an iron. It's soft to the touch and as it's stretchy it provides an excellent fit. Both Thing Two and I were charmed by the cute bow. I'm especially impressed with the shape, many skirts are either too tailored or else offer a shape that I personally feel is unsuitable for the age group. Once again the price is unarguably good at £3-£5. One of my bug bears about the mandatory uniform is the P.E kit, they have to have both an outdoor and an indoor one despite the weather often putting the kibosh on outdoor P.E in winter, it's just more expense. However, since it's mandatory it's always nice to find comfortable and affordable items. These jogger bottoms come in a pack of two, personally we don't need two but my ever fashion unconscious Thing Two is delighted to keep the grey pair at home as they're so comfortable! The Plimsols are cheap as chips so it's hard to argue about buying them when they're this price. All in all i'm impressed with the staple girls pieces. The quality,, styling and price all surpassed my expectations. 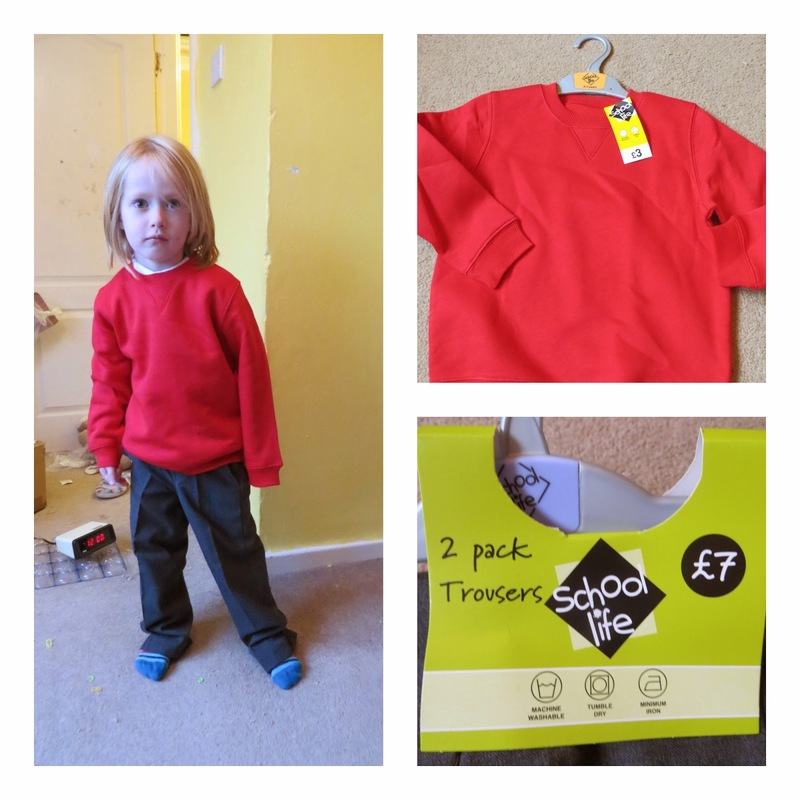 Thing Two turns 8 in September and these items are all size 8-9yrs and fit as i'd expect with room for growth too. The Preschooler will no longer be The Preschooler soon as in September at the tender age of 4y5m he'll be in full time reception class. Uniform isn't a new thing to him as he also wore it at the school preschool. Despite being 4, he's a dinky little fellow so it's necessary to find trousers in size 3-4. Thankfully this is not a problem at Matalan. Better still, they're elasticated waist allowing them to be 'pull on' perfect for his age range. The key to uniform at this age is comfort and ease. It's vital that they can dress/undress themselves so fiddle-free pull on trousers are a must. We received this terrific two pack which are competitively priced at £7. If you have a little boy you'll know how messy they get, so it's always wise to have more clothes than you think you'll need. Impressively for the price, they're also Teflon coated! 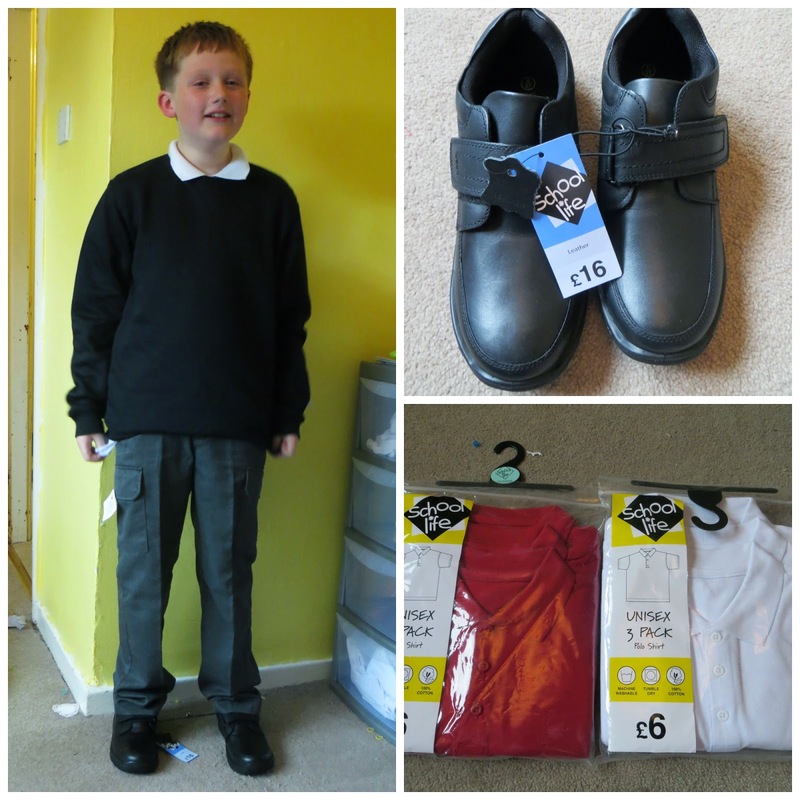 Although our school do have logo uniform, it's thankfully not mandatory which enable skint families like us to shop around and get cheaper alternatives. This red sweater is only £3, that means we can get two from Matalan for less than one of the schools own. Judging by the state they come home in from a hard of gluing, painting and playing, it's nice to be able to afford several spares whilst the washing machine is kept occupoied. The colour is lovely and vibrant with plenty of growing room and the sweater passes the cuddle test as it's so soft and squishy! This just leaves Thing One. Thing One will be starting his final year of primary school, year 6, in September. Trousers are often a nightmare to buy for Thing One. He's very tall for his age with a slim waist yet large bum. Anything none adjustable is just not an option. No problem at Matalan, the waists are adjustable using the familiar button and elastic system that is pretty universal. 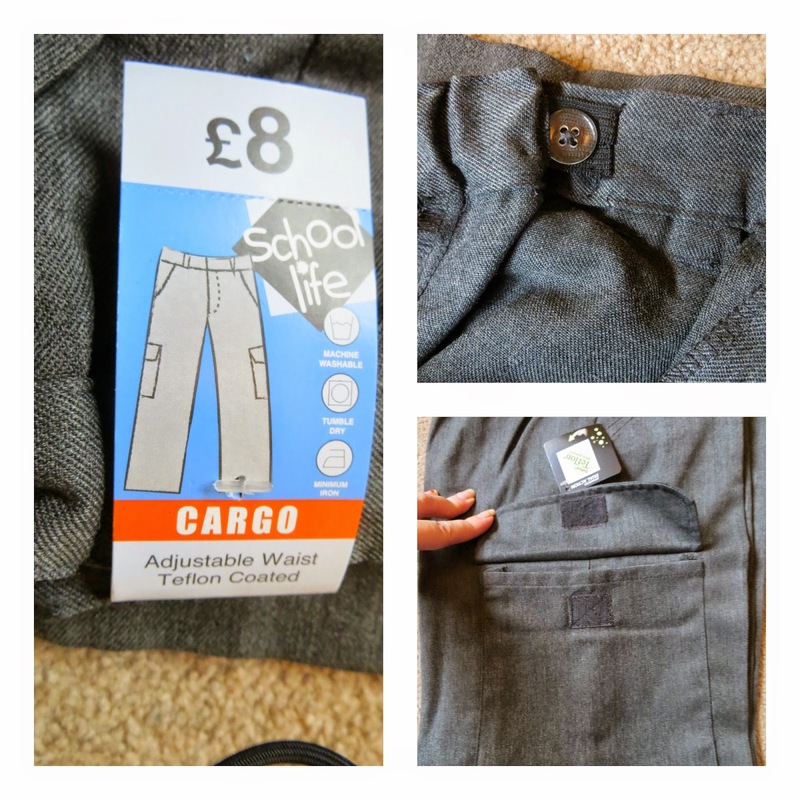 We chose the cargo style trousers as they offer a slightly more individual and boyish style then the usual formal ones which are so widely available. At the risk of sounding old, they're just funkier! The fit was perfect for him, usually trousers are either too tight across the bum, too gaping across the waist or too short yet these were ideal for Thing One. They come complete with Teflon coating and i'm drawn to the attention to detail such as the handy velcro on the pockets to fasten them. Thing One is not only going to be a Prefect when he starts back at school, he's also Head Boy. The Prefects are identifiable by their black sweaters (everyone else has to wear red) and red polo shirts. The polo shirts are great value for money, a great fit and lovely and thick 100% cotton. The buttons are easy to fasten and unfasten without the stiffness we've had from other brands. One of the main issues we have with Thing One is shoes. He literally walks through them. We gave up buying Clarks etc for him as they simply didn't last and we couldn't keep up, cost wise, with replacing them. However, we are adamant on leather shoes. These leather shoes from Matalan are an amazing £16 a pair, he's a size 4 now so we were especially impressed at the price. They have a older boy styling whilst still managing to keep the velcro fastening without looking babyish, Thing One is a tad lazy so prefers velcro over laces. I'm impressed with the chunky sole and grip, an absolute necessity in this wet and wild weather. Having been buying uniform for the past six years from various retailers I can honestly say I'm impressed with Matalan. I'd always blithely assumed they would be more expensive yet I can happily say, they're not. The prices are extremely competitive, the quality is plain to the eye and touch, the sizing is accurate and the styling is spot on. As a mum with three school age children I'll definitely be returning as and when more uniform is required. As an aside, we've already established that I'm a slattern without an iron (though in my defence, items were creased in the pictures as they'd come straight out of the delivery packaging!) but i'm also unsurprisingly lazy. I refuse to fork out the money, time and effort on name tags when I can use a laundry pen on the labels. It may sound strange to mention but the labels are actually really decent quality. Many cheaper brands we've had the ink immediately blurs and there isn't enough room to write despite them clearly having a gap for name and class. However, the same pen on Matalan labels, is clear with no ink run and the labels are actually large enough to write on! Hoorah!